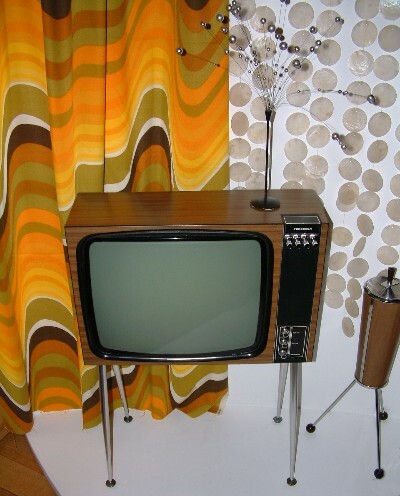 Television became a universal habit in the 60s. Cinemas were closing in large numbers and there was good reason to believe that the small screen would destroy the cinema entirely. By 1960, nearly three quarters of the population had television, and by the end of the sixties, nearly ninety-five percent. Britain only had two channels in 1960, BBC and IIV. A third channel BBC2 arrived in 1964. It was broadcast on 625 lines UHF, older sets could only receive 405 lines. BBC1 and ITV were still broadcast on the old band. In the mid sixties sets were sold that could receive both. The public were less keen on BBC2. Programmes were more high-brow. Consequently, take-up was slower than had been for ITV in 1955. 11.35 Four Just Men, weather, Epilogue. Yes that's right television on BBC1 started at 5.15pm - although in other months "Grandstand" would have been shown on Saturday afternoon. The "Western" on BBC1 was "Flame of the Barbary Coast" staring John Wayne and Ann Dvorak. "The Great Van Robbery" was a film about a daring robbery of a Royal Mint van. BBC2's "Cinema 625" was a Czech film called "Transport from Paradise" about concentration camps. The "Summer Comedy Hour" BBC1 (8.50pm) was a play "Almost a honeymoon", by Walter Ellis. It made it's debut in the West End in 1930. In 1965, a play written in 1930 would have been considered old fashioned, rather than nostalgic. ITV's offering "Undermind" was a thriller about a sinister organisation that was trying to disrupt Western Society. This kind of theme was fairly common in sixties film and TV. At 7.20 on ITV London you could see "The Saint" staring Roger Moore. Colour television was first broadcast at the end of 1967. In this era colour television sets were very expensive and take-up was slow. Originally colour could only be received on BBC2 - ITV and BBC1 were first shown in colour in 1969. In 1969, BBC2 viewers were able to see shots from the Moon in colour. The Moon landing itself was broadcast at 3.56am on a programme hosted by Cliff Michelmore, James Burke and Patrick Moore. Coverage had begun at 11.30pm the previous night and continued throughout the night - a real rarity in this era. In 1969 the BBC was busy converting existing programmes to colour - "The Troubleshooters", "The Doctors", "Z cars" and "Softly, Softly" all went out in colour that year. "Hi I need some information on the author, could you give me the name of the author and the year this was published? It's for a dissertation I'm writing, for the referencing.